Amenorrhea is a condition defined by the absence of menstruation for more than three months in a woman who was previously regular and more than nine months in one with a history of Oligomenorrhea (infrequent period cycles). Primary Amenorrhea means that menarche never occurred, that is to say that that a woman never started her menstrual cycle, even after the age of fifteen. Amenorrhea is a leading cause of female infertility, and if you are tired of wondering what’s wrong with your body and looking for a safe and healthy cure, we urge you to consider alternative medicine in the form of acupuncture to help manage this condition. Once you get to the root of the problem, it is much easier to solve it. Different women may be experiencing the condition due to different reasons, and therefore, not all treatments can be carried out in the same way. Secondary symptoms always vary, and each woman experiences these in a unique way. Because samples in studies are not fully representative, there is a bit of an information gap when discussing these effects. Usually, when Amenorrhea is diagnosed in female athletes, the cause is determined as excessive weight loss or exercise, and they are asked to cut back on their fitness routine and reduce their amount of physical activity. For an athlete whose entire life and livelihood depends on exercise, this is rather unfair. It also means that male athletes will get an undeserved advantage due to extra training time. For non-athletes, doctors usually prescribe oral contraceptives, such as birth control pills. All these do is flood your body with chemicals that stay in your bloodstream and create a toxic environment for you and your future baby. For correcting estrogen and testosterone levels, doctors prescribe endocrine therapy, which alter your hormonal make-up. This may upset the natural balance, and induces side-effects which are uncomfortable, inconvenient, and painful. Some newer studies are leading doctors to prescribe SSRISs, which are usually used for treating psychological disorders like bipolar, schizophrenia, and depression. This is dangerous, especially when amenorrhea is already linked with emotional and psychological effects. These pills, chemicals, and hormones offer a temporary solution to a permanent problem, and you will have to administer these drugs to help you manage the condition throughout your reproductive life. This is why more and more women are opting for an alternative solution, and trying acupuncture therapy. When compared to chemical or surgical intervention, acupuncture is a safe, healthy, and non-invasive method for effectively treating your condition. Acupuncture allows for energy to pass the main meridians and pathways of the body, allowing it to release endorphins and other hormones associated with healing. This energy is referred to as qi, and in Chinese medicine, it is believed that blood is the material manifestation of qi. When a woman does not menstruate as she is supposed to, it is believed that her qi is not flowing smoothly. Acupuncture allows for blood to flow smoothly, and as it goes to the ovaries, it relieves the area of cysts and other abnormalities. This means that acupuncture can help restore regular menstruation, and induce it in those who have never started. You can manage your Amenorrhea without pumping the body full of unnecessary drugs and chemicals. At our center in Aventura Florida, we believe in a combination of eastern and western medicine to help you receive the best of both worlds. 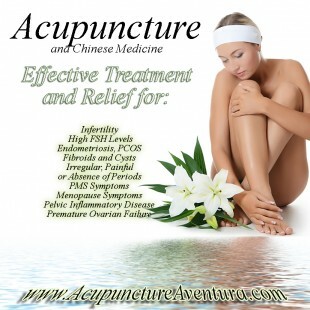 Acupuncture therapy has no adverse effects for your body, and can help maintain perfect reproductive health. To make an appointment, call us at (786) 537-7022 and we can begin your treatment immediately. Insurance is accepted.